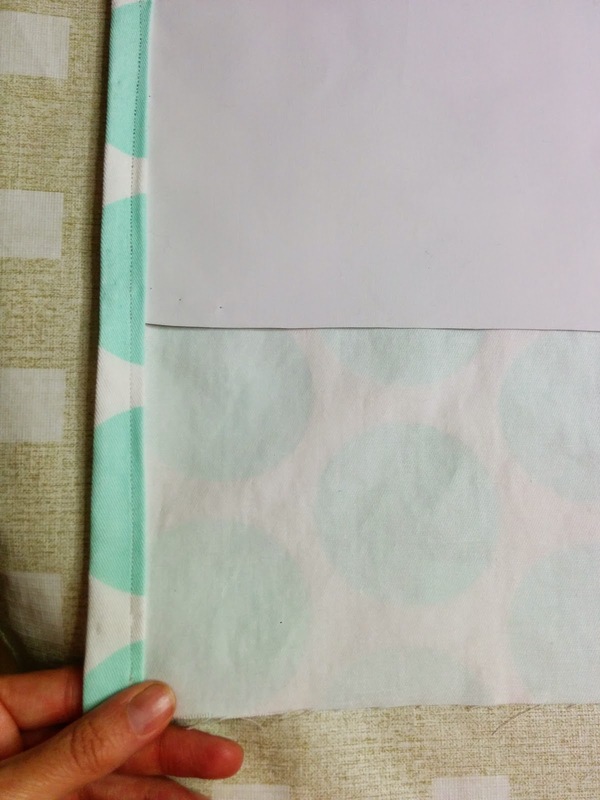 After hours of scouring for elegant yet fun blackout curtains for the nursery, I opted to make my own with fabric I found online. The finished panels are about 55" wide by 91". The width is convenient as the fabric comes in about 56" widths which means one less seam to try and cut perfectly straight. The most difficult part is handling such a large amount of fabric! I highly recommend setting yourself up on a table that can accommodate the full width of the panel, ideally rectangular. 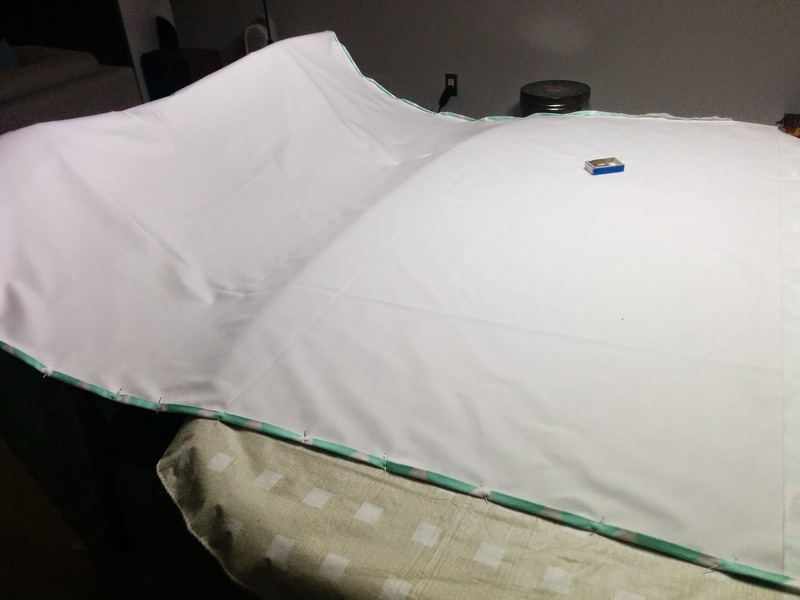 Also, I don't think I would make panels this large with a sewn-in blackout liner again. With this much fabric, it would have been simpler to sew the panels and then purchase hook-on blackout panels from any hardware store or Walmart. If you decide to go that route, buy them before making your panels. You'll need to make sure your panels are slightly wider than these, and that they have the same amount of tabs as the blackout has loops and are spaced equally as well. As you'll see from the pictures below, I am not a professional seamstress, and I use tools I have from around the house. Happy sewing! Although the lining I selected isn't officially washable, I opted to pre-wash and dry the decorative fabric on low (Fabric.com recommends hang drying) to pre-shrink it in case I decide to brave washing them with the lining in the future. You can skip this step if you don't plan to wash these anytime soon or if the fabric you're using is dry-clean only. Tip: If your fabric is very wrinkled, you may want to iron it prior to cutting. Cut the blackout lining to desired size of the finished panel. Because it will be directly tucked and sewn into the decorative fabric, there is no need to allow for additional seam allowance. In my case, the fabric was exactly 54" wide. To save myself trouble, I decided not to cut down the width, and only cut it on the length to 91". I used a square to mark a straight line across with a pencil and then cut along it using scissors. 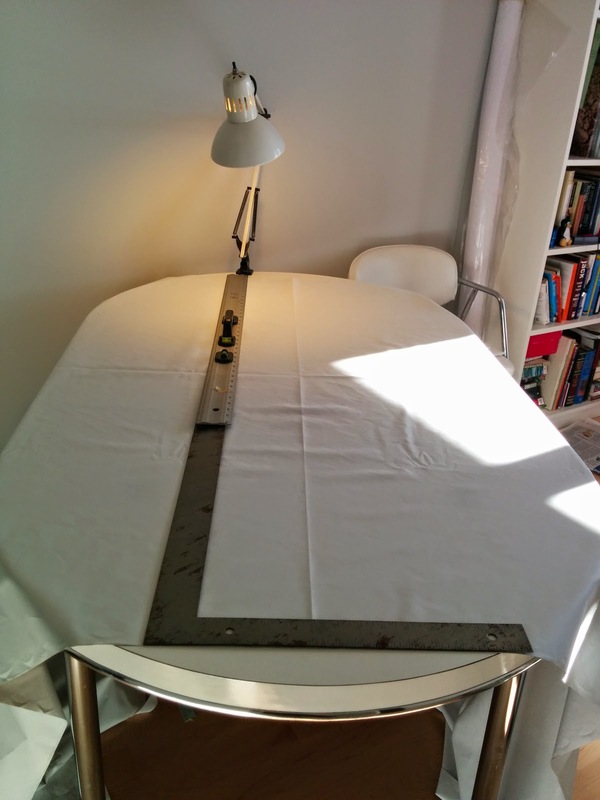 I wanted each panel to be 91" long, so I measured out 101": 91" length + 5″ for the bottom hem and 5″ for the top hem. Position the top of the lining exactly 5 inches from the top of the decorative fabric. Center the lining between the sides of the decorative fabric. Iron and fold each side of the decorative fabric over the lining twice, about 1/2" then another half an inch, and pin all along the side. Repeat on the other side. Simply sew along the edge, holding it tightly as you feed it through to help ensure the panel is straight and the fabric doesn't slip. 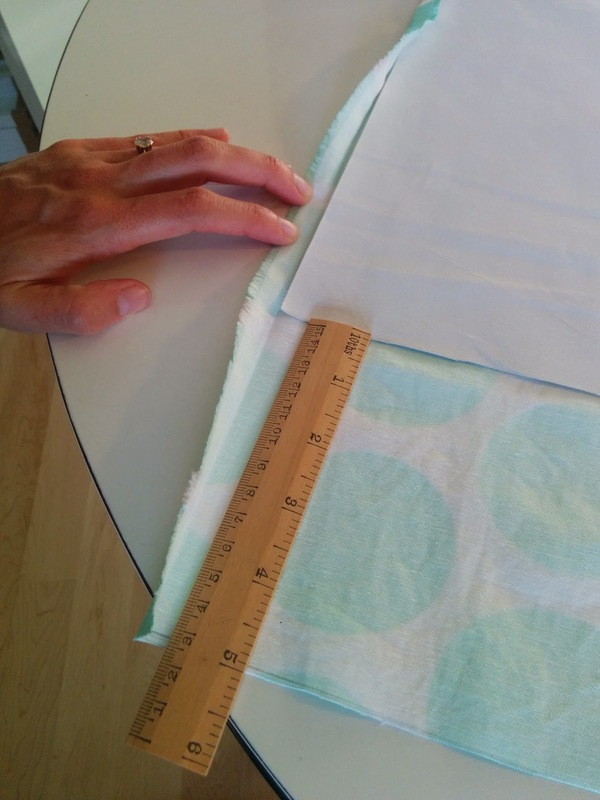 Fold over and iron an inch from the top, ensuring that you still have 4 inches between the lining and the edge of the folded fabric. Fold and iron the remaining 4 inches over the lining for a nice polished look. 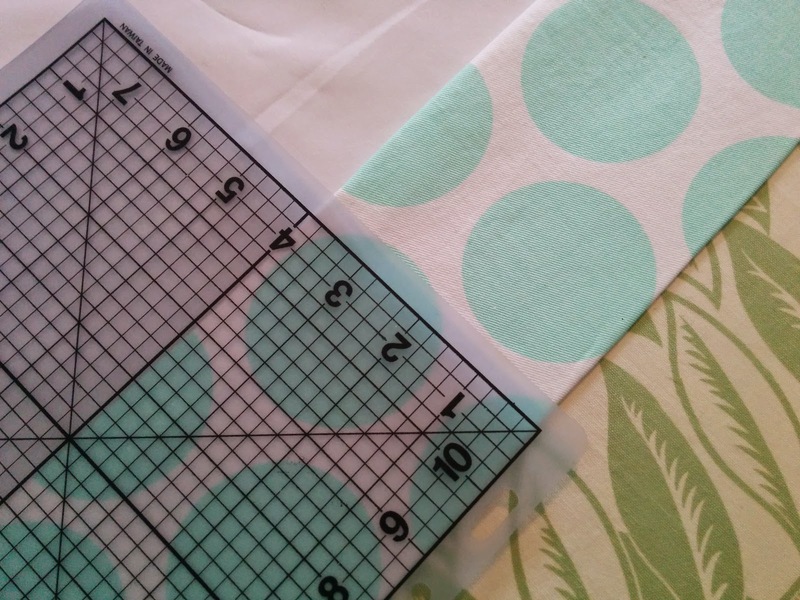 Use a square to verify that your panel is still straight after you fold it over, adjust if required. My corners were not perfectly square, so I cheated and tucked in the side edges as well to ensure it doesn't show on the front. Cut the correct number of back tabs for each panel. For 55" panels, I use 10 each, for a total of 20 back tabs. Each has a length of 6". I'm using leftover ribbon since it won't show, and have a variety of colours, but you can use a single one, whatever you have so long as its between 1 and 2" in width and all tabs are the same width. Pin the two side backtabs in an inch from the edge. Tuck one side of the tab under where you've folded in an inch of the fabric, and then fold the top down twice before pinning to the top of the panel. Calculate the spacing distance between each remaining back tab. 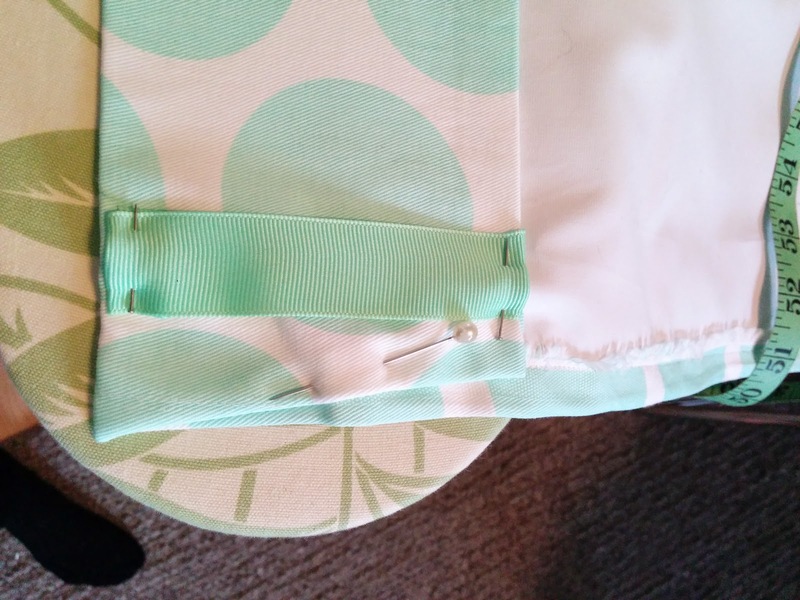 Measure the distance between the two pinned back tabs. In my case, this distance was 51 1/4 because my panel is actually 55" 1/4. I have 8 tabs left to place, and each is exactly an inch wide, so Each backtab should be between 5 and 6 inches apart. (51 1/4 - (8 x 1)) / 8 = 5.41"
Position back tabs according to the distance calculated above. Its hard to be precise to 5.41", so I chose to pin one to each side working my way towards the middle since I figured it'd be less obvious if the middle was slightly off rather then one side. Sew all four edges of the top. Start with the bottom seam and then continue along the side, the top, and finally the last side. You now have a single panel complete on three sides, only requiring the bottom edge to be hemmed. I have little faith in my ability to make perfect-length panels, so here's how I cheated: I made both panels, leaving the bottom edge unsewn. I then hung them on the curtain rod (prior to installing the curtain rod in my case) to verify the final length. Finally, I marked the actual length I wanted with a pencil on both panels, instead of the exact 91" I had previously measured. The rod we're using is quite fat, so the curtains were about two inches shorter than I intended for them to be. It means I have a small area that isn't lined at the bottom, but I think that's a worthwhile compromise as it doesn't show. 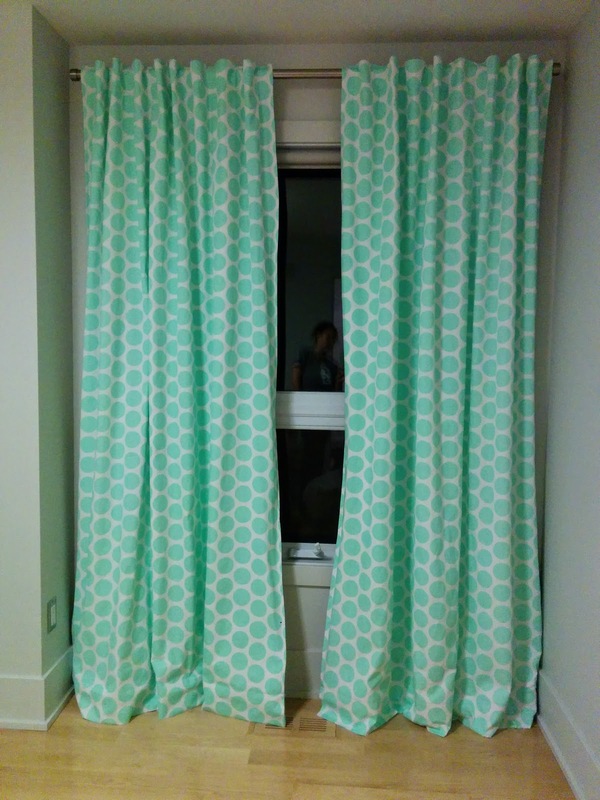 The curtains are the absolute perfect length, and the rod is located exactly where I wanted to hang it, mid-way between the top of the window and the ceiling. For preparation, follow the same instructions as the top, skipping the backtabs. 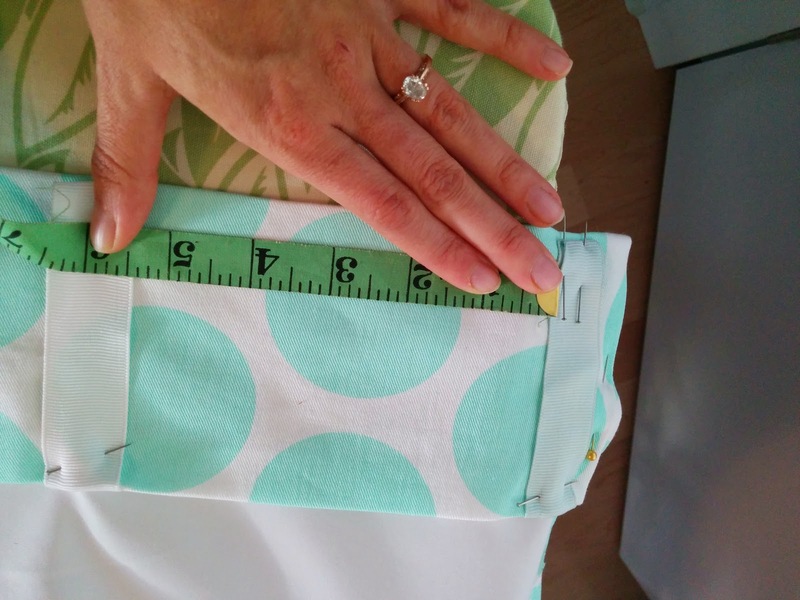 If you've adjusted the length, then you may need to adjust how much you fold over as a result. 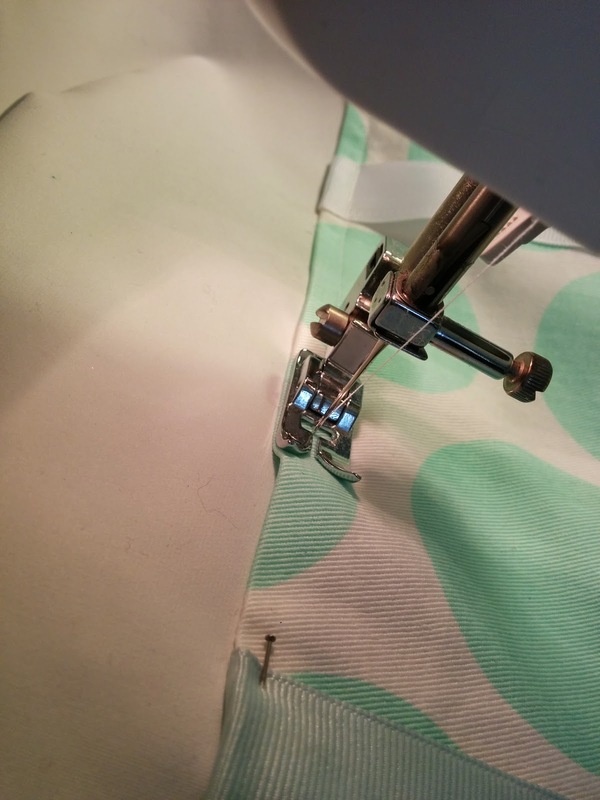 To sew the bottom, sew only the top seam, you don't need to sew the absolute bottom edge or side edges. And did I mention iron? Decorative fabric. 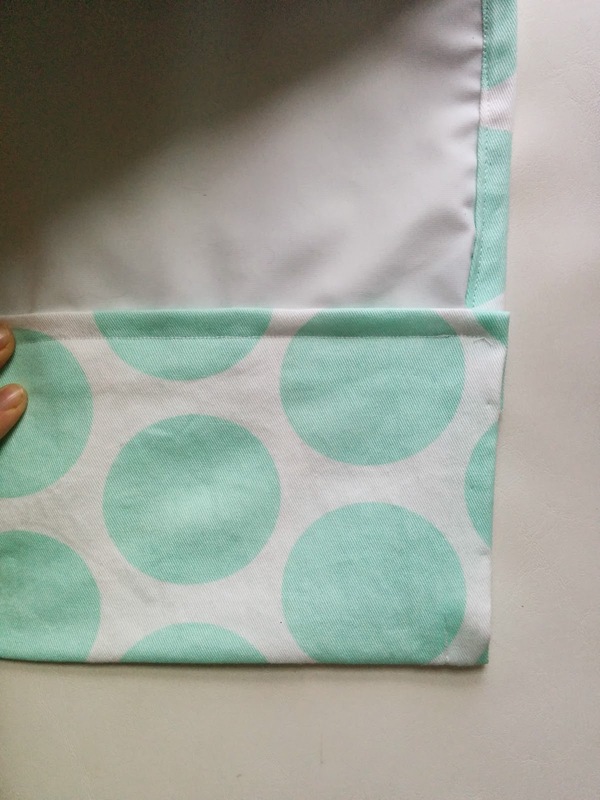 I used Premier Prints Fancy Dot Twill Mint. Lining fabric. I used Roc-Lon® Blackout Drapery Lining White. Looking for more inspiration? Here are some other tutorials you might like!